When walking the girls this morning with my thoughts bouncing to the week ahead and the month behind, a breeze came off the lake and for a moment I was held and engulfed, awakened to God right in the midst of the moment. Always present, never alone and gently carried whether I realize it or not. Listen, watch and hear all that is around calling out to let us know that we are alright. 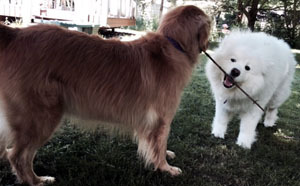 A few hours later, the girls began to play with a stick. It instantly made for play and fun. A stick, a simple stick. Enjoy each day and be open to the breezes and sticks that enter our day to call us out of our thoughts and worries into the moment. A breeze and a stick – sacred space found.